This bibliography records the initial publication of each original work by C.G. Jung, each translation, and significant revisions and expansions of both, up to 1975. In nearly every case, the compilers have examined the publications in German, French and English. Translations are recorded in Danish, Dutch, English, Finnish, French, Greek Hebrew, Hungarian, Italian, Japanese, Norwegian, Portuguese, Russian, Serbo-Croatian, Slovenian, Spanish, Swedish and Turkish. It is arranged according to language, with German and English first, publications being listed chronologically in each language. The General Bibliography lists the contents of the respective volumes of the Collected Works (of which this is Volume 19) and the Gesammelte Werke, published in Switzerland, and shows the interrelation of the two editions. It also lists Jung's seminars and provides, where possible, information about the origin of works that were first conceived as lectures. An index is provided of all the titles in English and German, and all original works in the other languages. Three specialist indexes, of personal names, organizations and societies and periodicals, complete the work. The publication of the General Bibliography, together with the General Index (Volume 20 of the Collected Works), complete the publication of the Collected Works of C.G. Jung in English. Part I. The Published Writings of C.G. 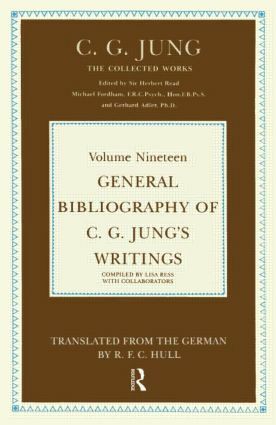 Jung: Original Works and Translations. Part II. The Collected Works of C.G. Jung/Die Gesammelten Werke von C.G. Jung. Part II. Seminar Notes. Indexes. Addenda.